About a month ago, someone asked me when Britton was going to visit Santa, and the question caught me completely off guard. I don't know if it's because I haven't gone to see Santa in about twenty years or because I was seriously sleep deprived at the time, but I had not given one second's thought about a picture with Santa. I asked my husband, my sister, and my mom about a potential visit, and all of them looked at me as if I were crazy. Of course Britton needs to see Santa, they all told me. I still wasn't convinced. 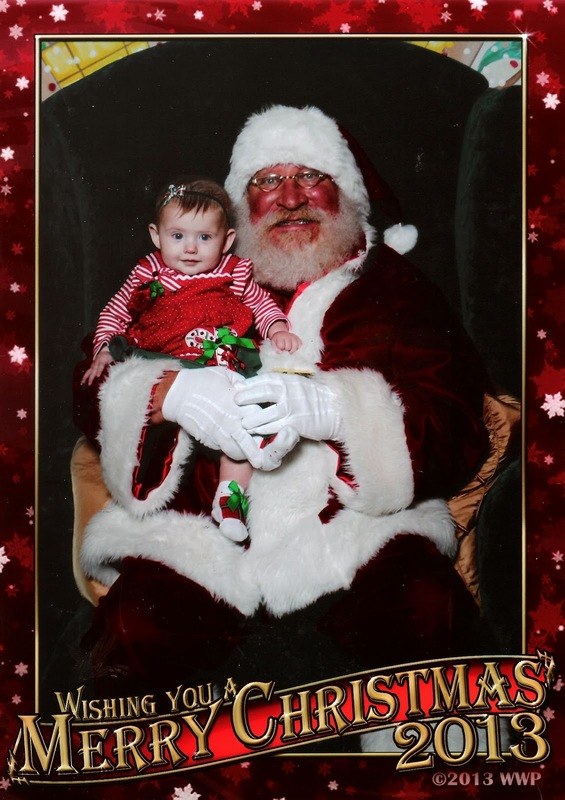 After all, she's only six months old and guaranteed to remember exactly nothing of this Christmas. Plus, I am deeply conflicted about Jolly Old St. Nick (but more on that later). Then, the Mommy Guilt started to set in. Britton's going to be the only baby who doesn't go see Santa. Britton will look at me in ten years and say, "Mom, what was wrong with you? Why aren't there any baby pictures with Santa?!" Also, I was going to completely ruin Christmas this year, and since it was the first Christmas that Britton would experience, there was basically a slippery slope from skipping Santa to skipping the whole she-bang in a few more years. So, off to Santa we went. Landon and I were unsure as to how Britton would react. Most of the time, she'll go to anyone. She does this so well that, half the time, I'm pretty sure that she would assist in her own kidnapping because she's just so friendly to everyone. But then there's that 2% of the time when she decides that I am the best thing since sliced bread, and if I give her to someone else, she gets completely and totally grumpy. Add this to the fact that she refused to take a nap yesterday afternoon, and we had a perfect storm of baby grumpiness brewing. She ended up being a little angel. Britton checked out Santa, looked at the camera, and even smiled a tiny smile. Piece of cake! I'm always worried about the creepy factor of handing my child to a perfect stranger dressed in a red wool suit, but this Santa was really nice and very patient as Britton figured out where to look for her picture. All in all, we couldn't have had a better experience. Plus, I highly recommend going on a school night because there wasn't a line at all. While the picture is impossibly cute (and I admit to sneaking peeks every few minutes! ), I'm still not totally sure about the whole Santa thing in general. As a kid, I didn't dwell too much on the idea of Santa. I went to Catholic school, as well as Methodist (and later Episcopal) Sunday School, so the religious aspect of Christmas was never far from my mind. Somehow, Santa had something to do with baby Jesus, but I didn't worry about it--I was one of those little kids that accepted things as they were. I wasn't the curious one asking where babies came from, or how Santa visited all of those kids in one night, or how in the world a bunny can carry baskets of candy. If my parents said it was so, I believed that it was. It wasn't until late elementary school that I deduced that something was off about Santa, and I got a little creeped out by the idea that a diabetic, bearded man that I didn't know was roaming around our house while I slept. While I know that many parents point to the Santa tradition as something fun and creative, I can't get away from the idea that I'm 1) lying to my child, and 2) getting away from the actual reason for the Christmas season. I'm all about making this fun for Britton--and heaven knows that I was a creative, highstrung child--but looking back, I'm not sure what a belief in Santa did for me growing up. I don't like lying about anything. Most people in my life would tell you that I'm too honest. So why would I spin a yarn to Britton about Santa? I'd rather her know that it is her parents, aunts, uncles, and grandparents who love her and want to gift her new things. Plus, how can I tell her not to lie when I'll basically be doing the same thing under the guise of holiday fun? The important part of Christmas to me is the time that I get to spend with my family: going to the church service Christmas Eve, making our Christmas Eve supper, opening the presents we've all worked so hard to purchase and wrap, and watching a holiday movie or two. The season isn't about getting stuff from a man in a red suit. I'm still not sure what I'm going to do about this in the years to come. It seems cruel to ignore Santa completely, but I'm not one of those people who think that Santa MUST be this huge part of our holiday celebration. I think I'd be more comfortable with Britton learning about the actual Saint Nicholas and the myths that have been a result of his actions. What are your thoughts on all of this? How did you think about Santa when you were a little kid? How have you approached the Santa component of Christmas, especially if you're Christian?